Charles II. 1660-1685. 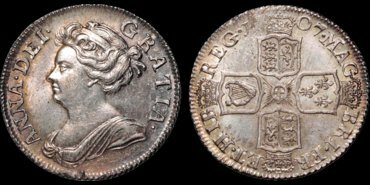 AR shilling. 5.89 gm. 26 mm. Thomas Simon's First hammered issue. Crown i.m. (No mark of value). His crowned bust left; no inner circle. CAROLVS II D G MAG BRIT FR ET HIB REX around / Quartered shield, long cross fleury over; CHRISTO AVSPICE REGNO around (Reverse 1). S. 3308. N. 2762. ESC 272 (R). 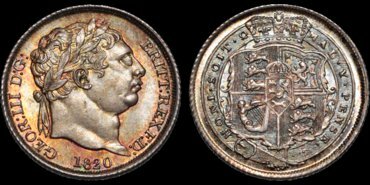 Extremely Fine; choice coin with attractive light toning over fresh surfaces; some obverse metal surface not fully annealed—on the flan before striking; overall this Simon issue is as made and is particularly rare thus. This was a hastily produced issue. 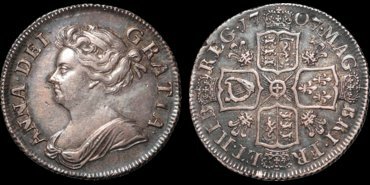 A month after Charles' return from exile in Breda Simon was ordered to "use all speed and diligence" to produce coins to replace the plain coinage of Cromwell and the Commonwealth. 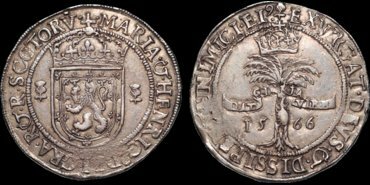 The lack of a mark of value was unpopular and the coinage was replaced a year later. James II. 1685-1688. AR halfcrown. 14.94 gm. 32 mm. 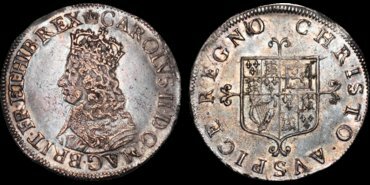 1688 QVARTO. His laureate second draped bust left / Crowned cruciform arms, plain angles (six strings in harp). S. 3409. Bull 759 (S) (ESC 502). 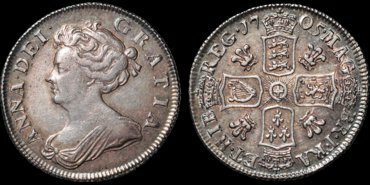 Very Fine; attractively toned; "16" of date weakly struck (location corresponds to the base of the bust on the obverse, an uneven flan). Anne. 1702-1714. AR halfcrown. 15.07 gm. 32 mm. After Union with Scotland. 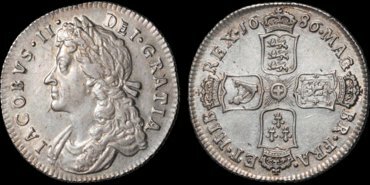 1714/3 DECIMO TERTIO. Her draped third bust left / Crowned cruciform shields, roses and plumes in angles (six strings in harp). S. 3607. Bull 1378 (R4) (ESC 585A). 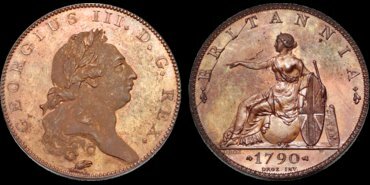 Good Extremely Fine; old toning with blue and gold highlights over surfaces with substantial mint bloom; there is a light old scratch on the cheek, slight nick in the beading at 11 obverse, and a bit of haymarking on the obverse; choice and rare. George III. 1760-1820. 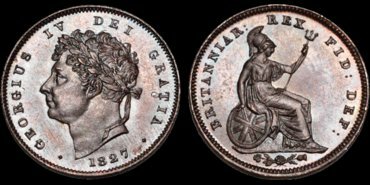 Restrike pattern halfpenny. 14.16 gm. 30 mm. 1790. 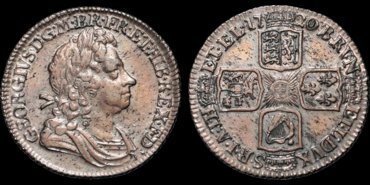 Laureate bust of George III right; GEORGIUS III D G REX around, an eagle head below / Britannia seated left, arm outstretched, left side undraped, shield and spear behind; BRITANNIA around, 1790 below; DROZ INV in small letters below. Peck 989. FDC; dramatic "cameo prooflike" coin with multi-hued toning; fine die breaks 9 to 11 on reverse. Blue paper wrap from Boulton Estate included with coin. Ex Davissons Auction 25 (1 February 2007) lot 159 ($1600). Victoria. 1837-1901. AR sixpence. 2.83 gm. 19 mm. Old veiled bust. 1893. S. 3941. Uncirculated; lightly toned over original surfaces. 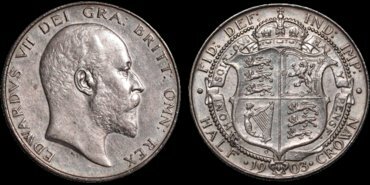 Edward VII. 1901-1910. AR halfcrown. 14.06 gm. 31 mm. 1903. His bare head right / Crowned shield in garter. S. 3980 (£2650 EF). Bull 3569 (R2) (ESC 748). NGC AU 58, mount removed; the mount indication is evident only on the edge where milling has been redone after the mount was removed (2, 4, 8, 10); overall, attractive light toning with blue and roseate highlights over fresh surfaces. A major 20th century rarity. 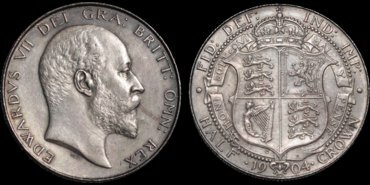 Edward VII. 1901-1910. AR halfcrown. 14.2 gm. 31 mm. 1904. His bare head right / Crowned shield in garter. S. 3980 (EF £1050). Bull 3570 (R) (ESC 749). 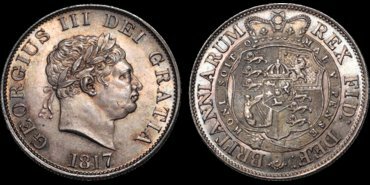 NGC "AU details, cleaned"; attractively retoned; (the "cleaning" was almost certainly a "dip" that had only a slight effect on the surface). SCOTLAND. Mary. 1542-1567. AR two-thirds ryal. 20.69 gm. 37 mm. Fourth period, 1565-1567. Mary and Henry Darnley. 1566. Crowned shield; thistle on each side; MARIA & HENRIC DEI GRA R & R SCOTORV / A tortoise climbing a palm tree with a banner reading DAT GLORIA VIRES; EXVRGAT DEVS & DISSIPENTR INIMICI EI. S. 5426. Cf SCBI 58: 1202 (similar if not the same die). Near Extremely Fine; beautiful old toning with iridescence. An exceptional example because of its full even flan and the sharpness of so much of the detail (note the palm tree and the tortoise). Ex Spink with tag. Also, collector tag. IRELAND. Henry VIII. 1509-1547. AR harp groat. 2.49 gm. 22 mm. 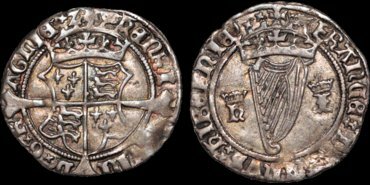 First harp issue, 1534-1540. Henry and Jane Seymour. Crown i.m. 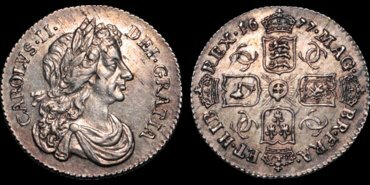 Crowned arms, long cross; hENRI CVIII DxGxR' AGLIExZ / A crowned harp of 7 strings; crowned h and I beside; FRANCE DOMINVS hIBERNIE. S. 6473. D&F 202. Extremely Fine; beautifully toned, with iridescence. NGC AU55 tag. IRELAND. 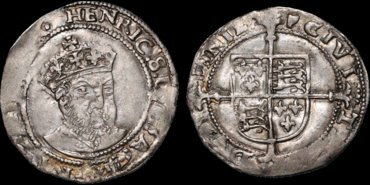 Edward VI (Henry VIII posthumous). 1547-1553. 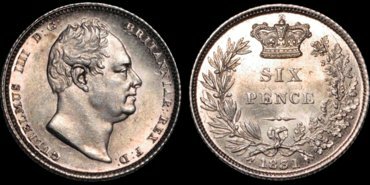 AR sixpence. 2.74 gm. 25 mm. Harp i.m., reverse only. 1547-1550. Smaller old head portrait of Henry VIII, bust facing slightly right; HENRIC 8 / Coat-of-arms over long cross fourchée; CIVITAS DVBLINIE. S. 6488. D&F 218. Good Very Fine; exceptional portrait, full round flan of good metal, king's name especially well struck. Particularly choice for this era. IRELAND. 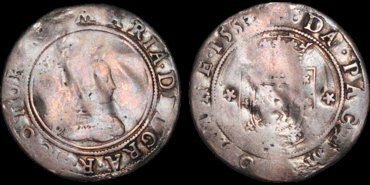 Edward VI (Henry VIII posthumous). 1547-1553. 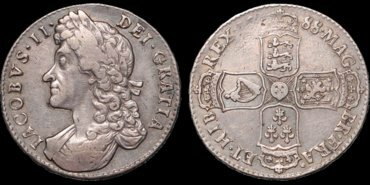 AR threepence. 1.06 gm. 18 mm. 1547-1550. His "late Tower" bust facing slightly right / Coat-of-arms over long cross fourchée; CIVITAS DVBLINIE. S. 6491. D&F 221. Very Fine; well detailed portrait; decent silver for this issue. 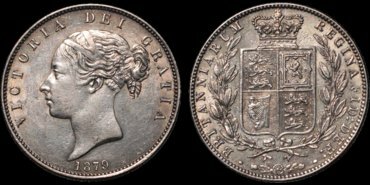 Scarce and seldom offered denomination and type. IRELAND. 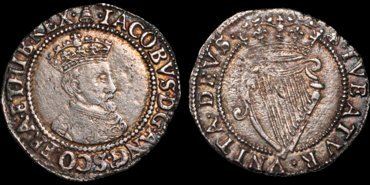 James I. 1603-1625. AR sixpence. 2.09 gm. 22 mm. First coinage. 1603-1604. Bell i.m. 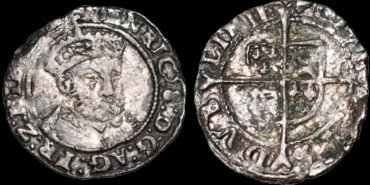 His first bust right (squared beard); IACOBVS D G ANG SCO FRA ET HIB REX / Crowned harp; TVEATVR VNITA DEVS. S. 6514. D&F 260. Good Very Fine; good strike on a full round flan; attractive toning with iridescence. Charles II. 1660-1685. AR sixpence. 3.15 gm. 20 mm. Milled coinage. 1677. His laureate and draped bust right / Shields in cruciform shape; interlocked C's in angles. S. 3382. ESC 571. Good Extremely Fine; lustrous and attractive; minor haymarking. Rare in this condition. George III. 1760-1820. 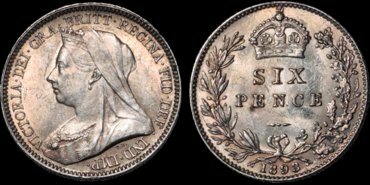 AR sixpence. 2.85 gm. 19.5 mm. New Coinage. 1820. His laureate head right / Crowned shield in Garter. S. 3791. ESC 2205 (S). Uncirculated; colorful toning; fresh surfaces. George IV. 1820-1830. AR sixpence. 2.83 gm. 19.5 mm. 1826. 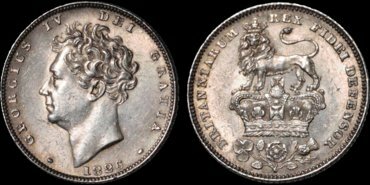 His bare head left (second head) / The British lion standing on a crown. S. 3815. ESC 2433. Extremely Fine; lightly toned; fresh surfaces. William IV. 1830-1837. AR sixpence. 2.81 gm. 19.5 mm. 1831. His bare head right / SIX PENCE crowned, olive branch left, oak branch right. S. 3836. ESC 2499. Lustrous Uncirculated. James II. 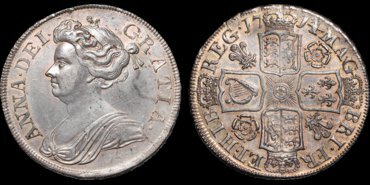 1685-1688. AR shilling. 5.82 gm. 24.5 mm. 1686. His laureate bust left / Cruciform shields, stops in legend; G/A in MAG. S. 3410. ESC 765 var (S) (clear G/A overstrike not listed by Bull but noted in Standard Catalog). Extremely Fine; bright, substantial luster; slight old scratch on reverse upper left quadrant. Anne. 1702-1714. AR shilling. 6 gm. 25 mm. With plumes. 1705. Her second bust left / Cruciform shields, plumes in angles. S. 3588. ESC 1392 (S). Very Fine; lightly toned with underlying iridescence in legends. Anne. 1702-1714. 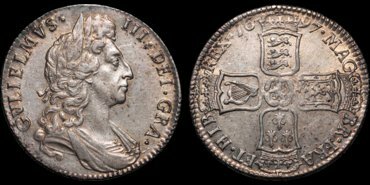 AR shilling. 6.04 gm. 25 mm. After Union. 1707. Her third bust left / Cruciform shields, plain angles (8 harp strings). S. 3610. ESC 1395. Good Extremely Fine; lustrous under light toning; flan scrape at the first "7" of the date that was present before the piece was struck. Anne. 1702-1714. AR shilling. 6 gm. 25 mm. After Union. 1708. Her third bust left / Cruciform shields, plain angles. S. 3610. ESC 1399. Good Extremely Fine; lustrous; slight rubs on the cheek and forehead keep it from fully Uncirculated; old toning. Anne. 1702-1714. AR shilling. 5.94 gm. 25 mm. After Union. With plumes. 1707. Her third bust left / Cruciform shields, plumes in angles. S. 3611. ESC 1396 (S). 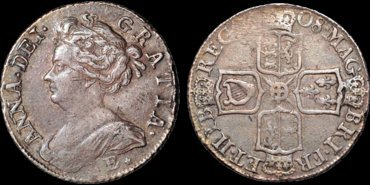 Near Extremely Fine; attractive old toning with purplish hues, hints of iridescence in underlying surfaces, a few light marks in obverse field. Anne. 1702-1714. AR shilling. 5.95 gm. 24 mm. After Union. Edinburgh Mint, normal coin die axis. 1708E*. 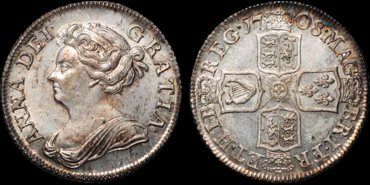 Her fifth "Edinburgh" bust left, 1708E* below bust / Cruciform shields, plain angles; no stops after G, R, B. S. 3615. ESC 1439 (R2). 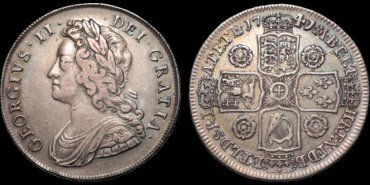 Near Very Fine; old toning, some minor marks; overall a decent example of a rare type. George I. 1714-1727. 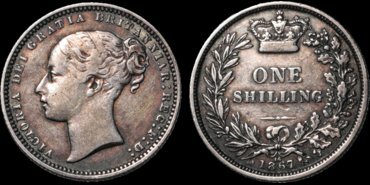 AR shilling. 6.04 gm. 25 mm. 1720. His first laureate and draped bust right / Cruciform shields, plain angles. S. 3646. ESC 1572. Good Very Fine; haymarked flan; some iridescence under attractive light brown-red toning.